UVA alum James Perla produces “Maps, Magic, and Medicine,” a podcast that explores environmental conservation and indigenous cultural survival in the Amazon region. “These stories are the first way to reimagine our relationship to the natural world,” he says. What is nature? We assume we know what it is – and it’s usually a place without humans. The idea that nature is something separate from humans is a founding tenet of wilderness conservation, but the notion has proved detrimental to indigenous and tribal peoples, as well as to the environment in many areas around the globe – especially the Amazon rainforest. There are other, human-inclusive ways of viewing the natural world that are proving crucial in efforts to save the Earth and address climate change, said James Perla, a University of Virginia alumnus producing a new podcast, “Maps, Magic, and Medicine.” Working for the Amazon Conservation Team, a non-profit organization based in Arlington, Perla brings together a range of voices – including some from the UVA community – to discuss environmental conservation, cultural survival and land rights in the Amazon region. The Kogi Indians of Colombia, who are featured on “Maps, Magic, and Medicine,” called attention to what we now call global climate change more than 30 years ago in a BBC film directed by Alan Ereira. Observing glaciers melting in the Sierra Nevada de Santa Marta mountains, the Kogi sought to warn the world about the ecological catastrophe on the horizon. They urged outsiders/Westerners (whom they call “Little Brother”) to change their way of living and exploitative relationship with the environment in order to avoid environmental disaster. Spreading across nine South American countries, the Amazon region is home to hundreds of distinct indigenous groups, some with only a few hundred individuals. Many of them want to preserve their longtime ways of living in concert with the rain forest and the neighboring landscape. 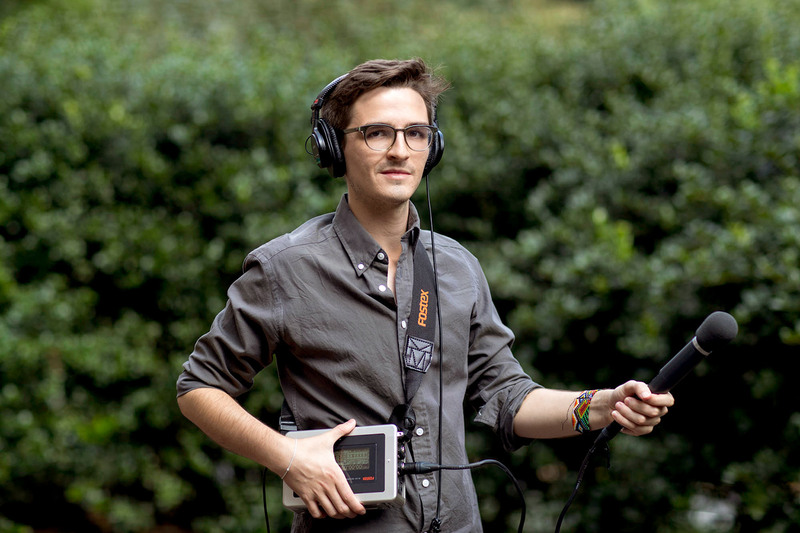 Perla, who earned his bachelor’s (in 2015) and master’s (in May) degrees from UVA’s English department, learned audio-recording technology while interning for American Public Media’s “Marketplace” in New York and the Charlottesville bureau of Roanoke’s WVTF/Radio IQ public radio station. “I took courses in English, anthropology, music composition and ethnomusicology,” he said, “all of which informed and improved my ability to carry out this podcast project. Erik DeLuca, a recent Ph.D. graduate in UVA’s music department, also helped me with recording environmental sounds. It’s no accident that episode one is called “People First.” In it, Perla describes a shift in the approach that the Amazon Conservation Team began 20 years ago, when nonprofit workers and scientists joined with the region’s inhabitants to integrate culture and indigenous values into conservation planning. 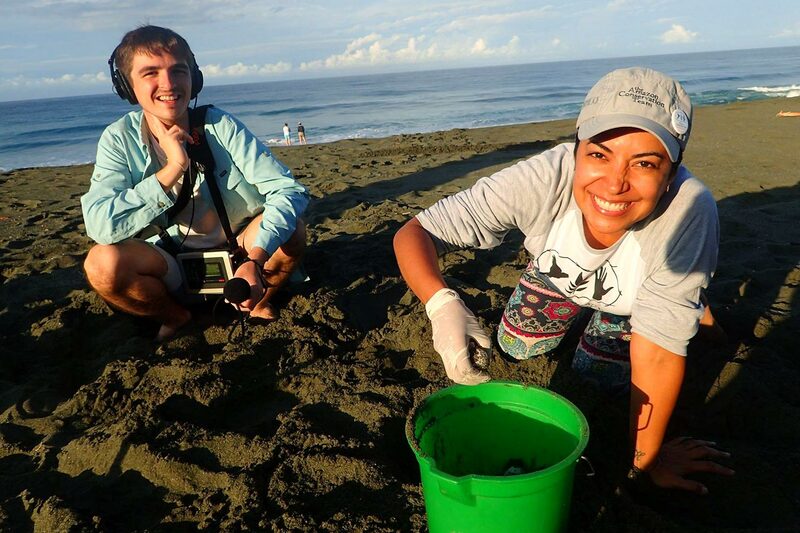 Perla made most of the recordings during a trip to Osa Conservation in Costa Rica last summer. “The organization I’m working with [ACT] sponsored the trip for representatives from the indigenous groups from Suriname, Colombia and Brazil. It was a week of more or less constant recording in the rainforest and near the ocean,” he said. “Osa Conservation is located on Osa Peninsula in between the Golfo Dulce and the Pacific Ocean. They say it’s ‘where the rainforest meets the sea’ because you can walk 20 minutes and arrive at the Pacific Ocean. The peninsula alone houses 2.5 percent of the world’s biodiversity, so it’s a really unique area. Bob Swap, a research professor of environmental sciences at the University, who has worked in South America and Africa, contributes an important perspective to the second episode, one that he has imparted to students for about 30 years: rather than going to a developing area determined to fix some problem, instead be prepared to listen and learn. “It has been my experience in conservation and community engagement work in developing contexts [that] it is very easy to come in with your sense of perceived needs without ever listening to the voice of those with whom you wish to engage,” Swap said. Perla said he hopes the range of voices – more from Swap; interviews with the founders of ACT, Mark Plotkin and Liliana Madrigal; and with members of the Kogi, the Inga and other indigenous groups in Colombia, Suriname and Brazil – will instill a sense of wonder and curiosity. The indigenous people in this region have specific environmental knowledge thousands of years old, such as cultivation of medicinal plants, along with their spiritual beliefs tied to the landscape. “These belief systems should be able to continue existing even if we don’t understand them,” he said. “The podcasts provide rare and crucially important holistic perspectives on under-appreciated connections between biological and cultural diversity,” said UVA anthropologist James Igoe, who’ll also be part of a future episode. “As such, they are very important to both popular understandings of the environment and conservation policy.” Igoe said he counts Perla among the best students he has worked with in his career. Madrigal, a Costa Rican conservationist, and Plotkin, an ethnobotanist, have focused on working closely with indigenous communities, building long-term relationships, to help preserve and pass on the knowledge of medicinal plants and healing practices. Their innovative work also brings traditional knowledge into the 21st century. One topic Perla will cover in the next episode of the podcast (set to release in early October) is “participatory mapping,” which involves “indigenous groups [using] smart phone and GPS technology to map and manage deforestation, species numbers and biodiversity in their territory,” Perla explained. The podcasts, each about 15 minutes long, will be released monthly, with two posted so far (plus several promotional spots) at the Maps, Magic, and Medicine website. He plans to produce some Spanish-language content as well. “Many of the indigenous groups don’t speak English. So for me, they’re an important audience that I’m not reaching with English-only content,” he said. Perla is also flexing his tech muscles on another project for the Carter G. Woodson Institute of African-American and African Studies: he’s helping to make a digital archive of the Civil Rights Movement from material in UVA’s Small Special Collections Library, especially the papers of Julian Bond, and a few other sources. The project also involves undergraduate and graduate students. The archive will feature prominently in the upcoming Julian Bond Memorial Symposium, to be held Oct. 20 and 21. Top photo: In Colombia, the Kogi territorial team uses an electronic tablet to record the location of a sacred rock that they believe has a spiritual connection to distant archaeological sites.